Hawaii is the kind of place I can visit for two weeks and feel my paradise-absorption levels at full saturation. By the end, I can’t take any more of all that good stuff: sunshine, pristine beaches, postcard sunsets, snorkeling over reefs teeming with jewel-toned fish in turquoise water warmer than the air. And did I mention the fruit? Mangoes, passion fruit, pomegranates, dragon fruit, apple bananas, pineapples, papayas…all just hanging off trees for the picking! Maui is fruit smoothie heaven. And that is where I was, the end of November, during the blizzard that had blitzed Buffalo. Winter had arrived in New York. And I was in a good place. I was there to help my friend with some home decor projects, so it was a kind of workation. It also was a place where, I had asked her six months previous, I might have a little mini-nervous breakdown, should I need it. Just a little quiet corner. It turns out that, happily, I didn’t. So what can I do? I asked. She handed me a paint brush and pointed at the louvre doors. In my life I had done this task twice before, decades apart, each time swearing never again. But this time was different. 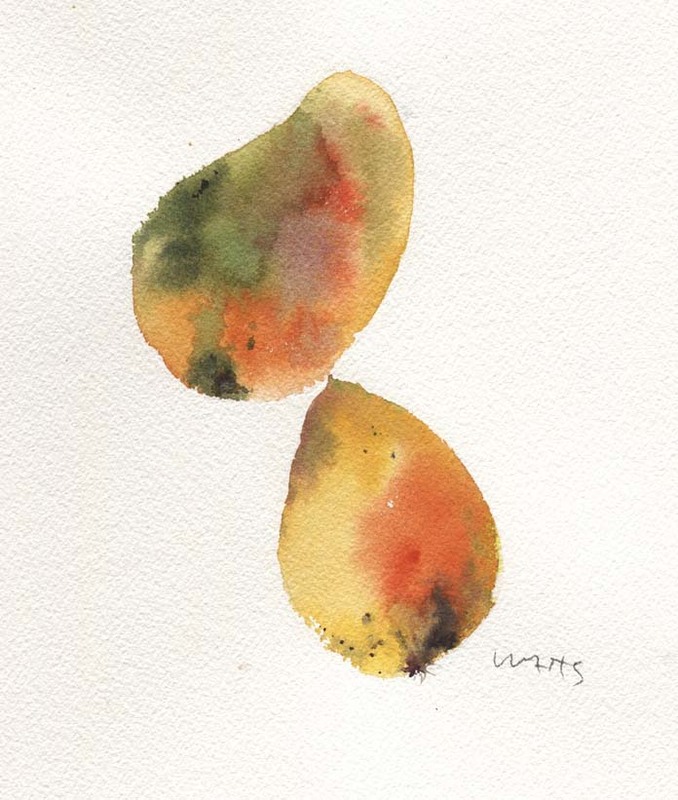 I was on the porch, overlooking her tropical garden, and her gardener kept bringing me fresh-picked apple bananas. New to me, these small cousins to the ubiquitous bunch of Chiquitas in my kitchen seemed to be infused with something “other”–mysteriously evasive yet citrus-y. I became hooked. I had my iPad and Ella Fitzgerald wafted over the warm air. I could paint louvre doors forever. My Arches watercolor block was in my carry-on luggage, and so, dammit, I was going to paint! (I have a history of good intentions but no action when I pack art supplies). I wasn’t all that ambitious to switch brushes, but I took a few moments to paint what was around. 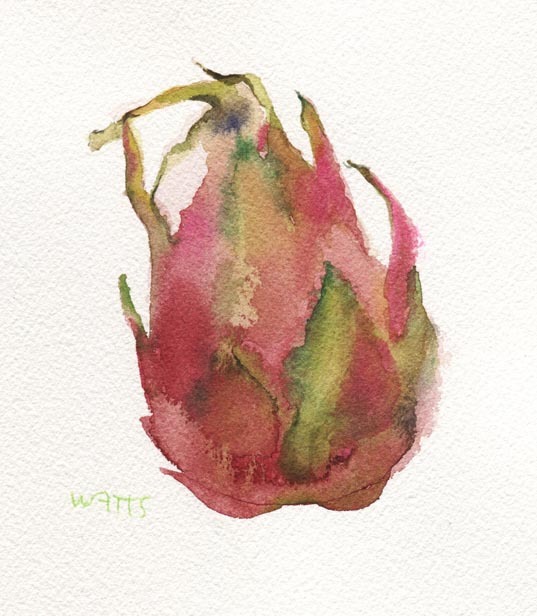 I didn’t do the dragon fruit justice–the skin is luminous, neon, even as it aged. 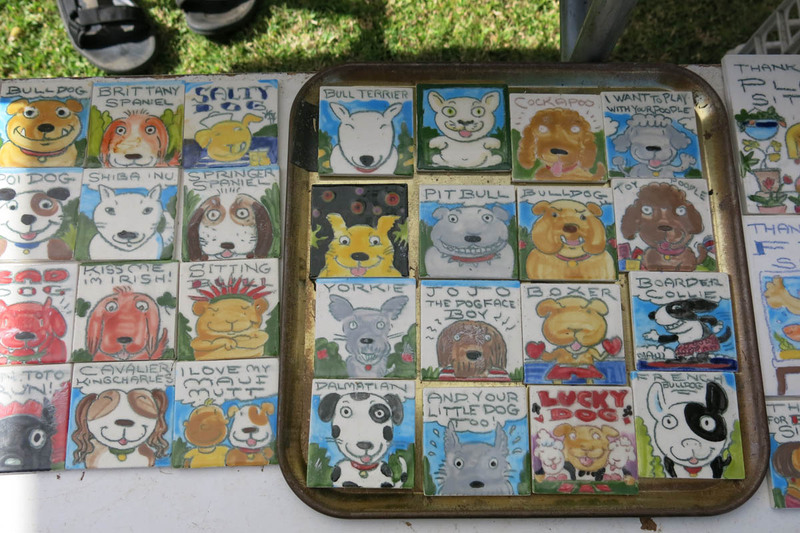 While wandering around the Maui swap meet, I saw some familiar characters drawn on tiles and magnets. Sitting there with his wares was Kimble Mead, one of my favorite illustrators from the 1970s and 1980s, whose work adorned every magazine I read in New York City at that time. 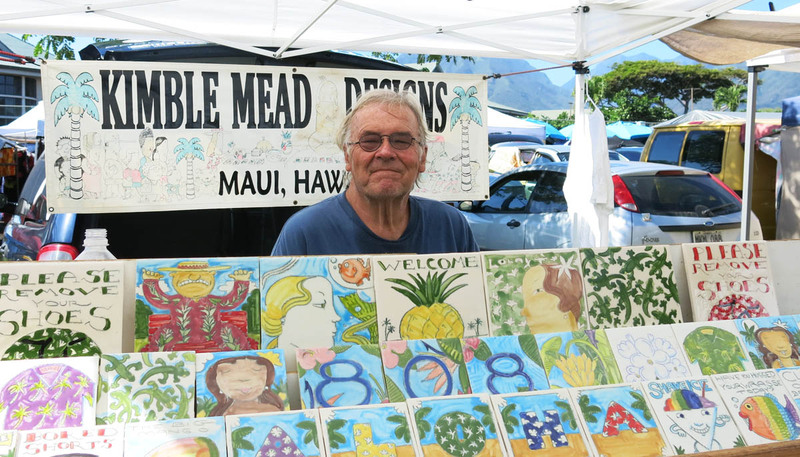 He had moved to Maui, ditching those icy sidewalks and portfolio-schlepping. Kimble’s style is just as delightful as it ever was–sunny, quirky, and easily adaptable to his new home. I snapped up a few. 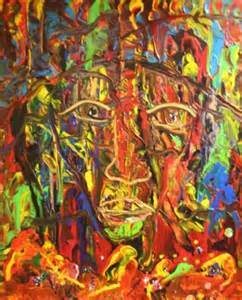 I visited some galleries in Lahaina and saw a lot of tourist art, or “art.” Picasso rubbed shoulders with Anthony Hopkins, Miro with Tony Bennett, Rembrandt with Red Skelton. Gaudy souvenirs and impulse purchases for bottomless wallets. Once again I felt that I don’t really know who my market is, or if I even have one. 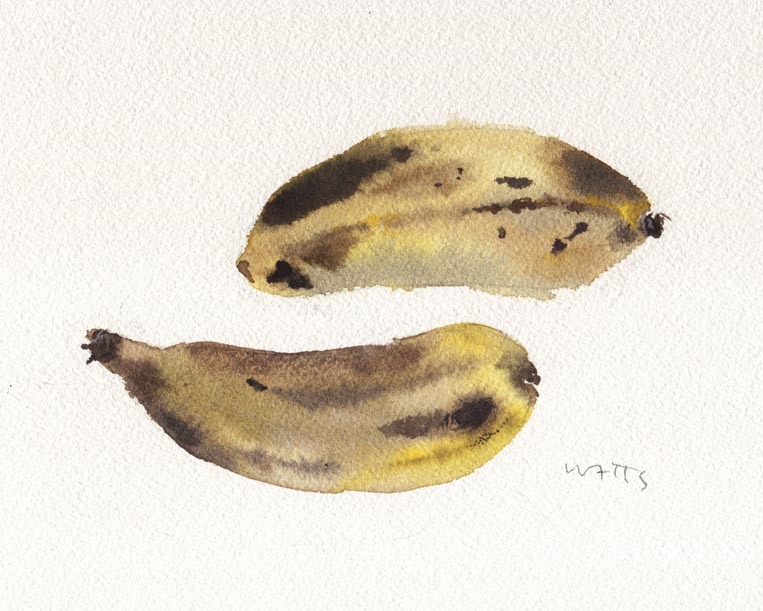 Who wants to buy a watercolor of a couple of aging mangoes or apple bananas? 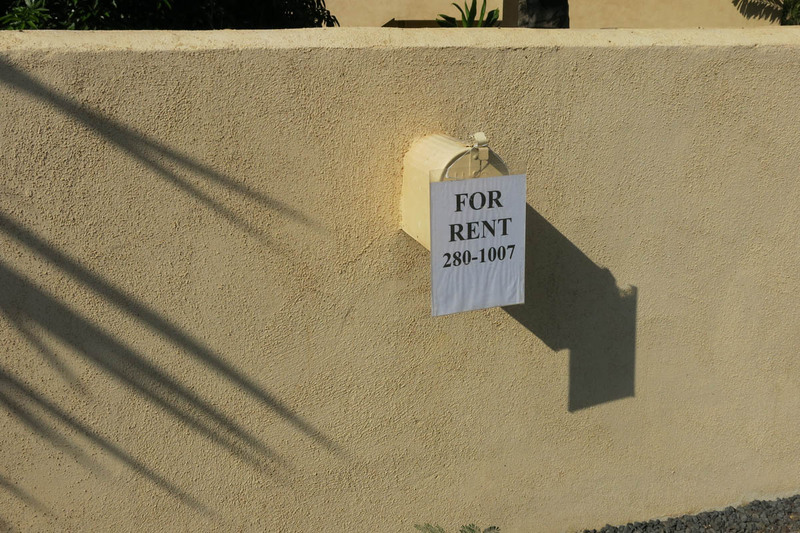 Not in Lahaina, where you can buy a REAL Hannibal Lecter! I wandered the neighborhood my friend lived in, and noticed the mailboxes. That became a photography theme I’ll share in the next post. 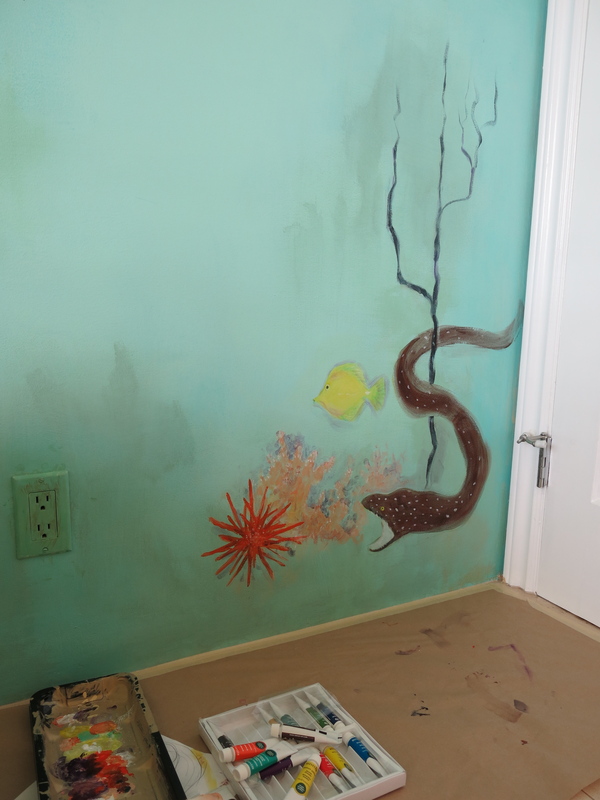 My friend requested a small mural in the corner of the guest room against a sea of faux painting. I braved Black Friday at the Queen K Shopping Center and ducked into a Ben Franklin arts’n’craft store to buy a set of acrylics. When I came out to the parking lot I discovered the car battery had died. Waiting for AAA was a very zen experience, the lesson of which got lost in one of the time zones I passed through. The new battery became my hostess gift. 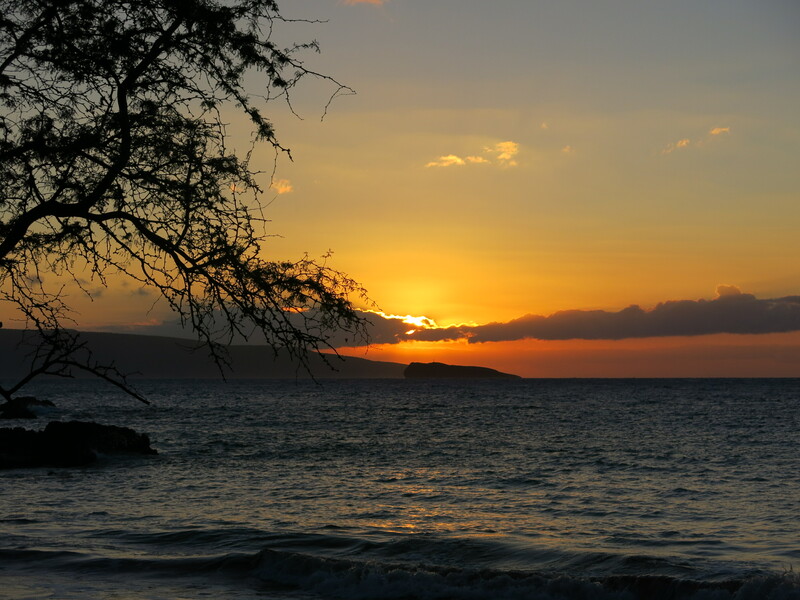 And just so you aren’t disappointed, here is a Hawaiian sunset. Sometimes it’s good to be a simple tourist. I really enjoyed this article. And the mural and watercolors. Thanks for adding the sunset! Having never seen one, I believe you did do the dragon fruit justice. Sounds like a wonderful time. Erica, thanks, and they are very complicated! It’s fun to see how you incorporated art into your workcation. The fruit watercolors and the mural are wonderful.